Visit us for all your salon and spa needs. We are open Tuesday through Friday 9:30 am – 6 pm and Saturday 9 am – 2 pm. From highlights and hair cuts to keratin treatments, massage and skin care, we're your one-stop-shop! "I love going to Kelsie! She always does a great job on cut and color and is so fun to be around. I really lucked out when I was told about her." Hair care is our specialty. We love to design the perfect look just for you! Come in and see us to experience the salon that will exceed your expectations. Relax and take a break, you deserve it! Our massage and spa services are perfect for your next day off. You'll feel rejuvenated and refreshed, ready to tackle that next to-do list! Find the skin care treatment that brings your glow back! We have exactly what you need to revitalize your tired skin. We have a wonderful team of experienced ladies ready to make you look and feel your best! 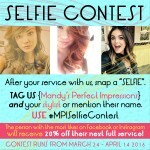 There’s just a short time left to enter your selfie and get 20% off your next visit! Contest ends April 14th – which is THIS THURSDAY! And remember to follow us on Instagram! @mandys_perfect_impressions! NEW YEAR = NEW YOU! 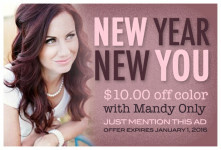 Get $10.00 off color (with Mandy Only) between now and January 1, 2016! Call to schedule today 731-7487 and mention this email! From now, until December 31st, receive FREE Shampoo OR Conditioner with a purchase of the Keratin Complex Straightening System. If you have already experienced this amazing treatment, refer a friend to have the service with us, and get a FREE HAIRCUT!! Get 15% off any hair care purchase when you mention this post at checkout! Thanks for visiting our new site!